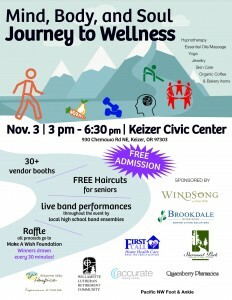 A Wellness Fair like you have never seen! 30 vendors, including hypnotherapists, yoga specialists, skin care experts, organic coffees and drinks, jewelry and much more! There will be live band performance from local high school ensembles and even free haircuts for seniors! Raffle prizes every 30 minutes! All proceeds go to Make-A-Wish Foundation!